Every August Singer and Farmers Wife Coreen Scott leaves the golden ripening fields of East Lothian where the harvest is in full swing and heads into Edinburgh to perform at the Fringe. This year Coreen returns to AMC St Brides along with guitarist and vocalist Alasdair Morrison and multi instrumentalist Andy Brown. 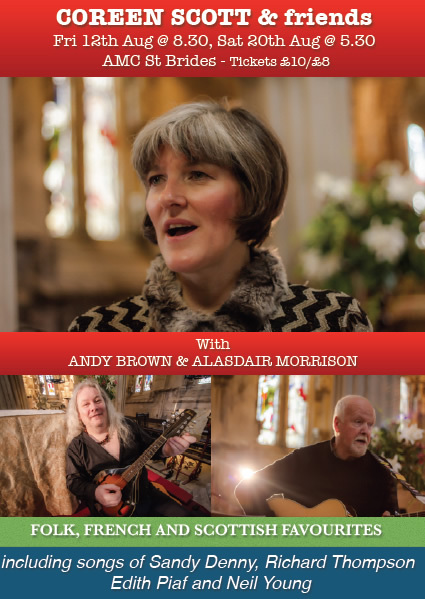 Following their recent sell out Candlelit concert in the world famous Rosslyn Chapel this trio will entertain you with a great selection of folk, french and scottish favourites including the songs of Sandy Denny, Richard Thompson, Edith Piaf and Neil Young.